Hello Friday!! This week sure felt a lot longer than 4 days, maybe it was that extra long weekend that threw me for a loop, but things have really been a little weird this week. I just couldn’t get back into the swing of things, but it’s Friday now so I’ll worry about getting back into the swing of things on Monday! With it being Friday, that means it’s time for my weekly Pretty Pics from Pinterest post, this week we’ll be oogling some pretty sunrooms. I’ve been working on a little sunroom make over at my house, our sunroom has sort of been a catch all for the stuff we couldn’t let go of, but didn’t really know what to do with. That sort of sounds like the rest of the house doesn’t it? Anyways, I’ve decided it’s high time that the sun room become a room that we can actually use. Our house is pretty small, about 950 sq ft excluding the sun room. So, we really need that extra hanging out space that the sun room provides. I’ve gotten the room fairly well cleaned out there are just a few things left to do. This weekend I have made a promise with myself to finally finish it, or at least put some curtains up. With that in mind I’ve been hitting up Pinterest for some finishing off design ideas for this sunny little room. By the way, if you are on Pinterest and would like to follow me, I am April@theyellowcasa.wordpress.com, I still don’t know how to put a Pinterest button on my little blog. Maybe I need to own my domain? Does anyone know how to get those snazzy Facebook and Pinterest buttons?? Anywho, on with the eye candy! As always, if you are interested in seeing the original source of these pretty pics click on the photo or the link provided below the photo to be taken to the original website. I love the colors she used in this room, and that coffee table is awesome, her how to can be found here. Also, those floors are a cool idea as they are wood look tile. I toyed with the idea of putting those throughout our house, but threw the idea out when I priced out how much that would cost for the whole house. Instead we went with vinyl plank floors, you can read more about my floors here. Julia at Hooked on Houses has such a sweet sun room, it looks like the kinda place you could curl up and read a book in. I am really loving the green and yellow she used in this room. 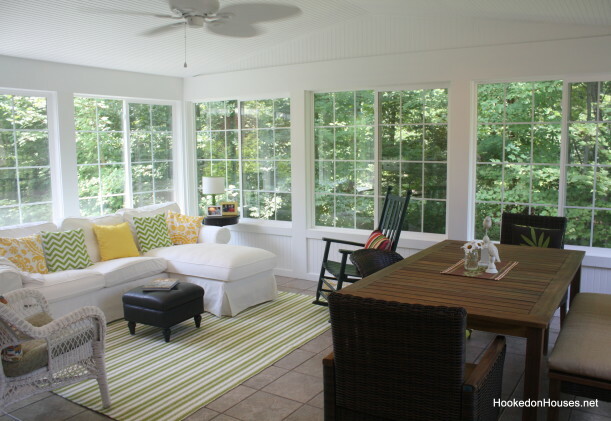 How could I not include John and Sherry’s sun room, they are the rock stars of home blogs and DIY renovations, if you haven’t heard of them you definitely need to check them out. So, I am sharing their room because I loved their floor embellishments and window treatments. I may have to utilize their curtain concept for my sun room, soft yet still allows the light in and the view to be seen. There ya have it, three gorgeous sun rooms, if that doesn’t give me motivation to finally get my sunny room functional I don’t know what will. Have a happy weekend everyone!!! Gotta love Pinterest! So many wonderful ideas, and the best part is incorporating a touch of everything you like into your own creations! That is the best part of Pinterest, so many great ideas that still allow you to put a personal touch on things. Love those sun rooms esp the first one! To Pinterest button on here, Go to your pinterest page, about, pin it button, then copy that html they give you and add it to your side bar as an image widget. I think that’s how I did it…? I would definitely call up with a book in any of those rooms!